Explanation: NGC 7027 is one of the smallest known planetary nebulae. Even so, NGC 7027 is 14,000 times larger than the Earth-Sun distance. Planetary nebula are so named because the first few discovered appeared similar to planets. Planetary nebula are actually dying stars, though, that have recently run out of nuclear fuel. The outer gaseous shells are expelled by an unknown process, frequently creating spectacular displays. 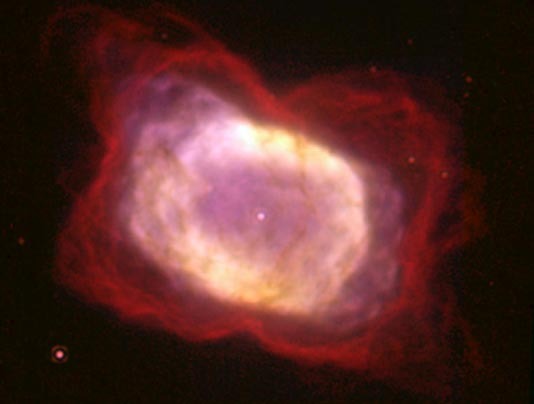 In the above picture in infrared light, the hot central star is visible. Our Sun will become a planetary nebula in about 5 billion years.